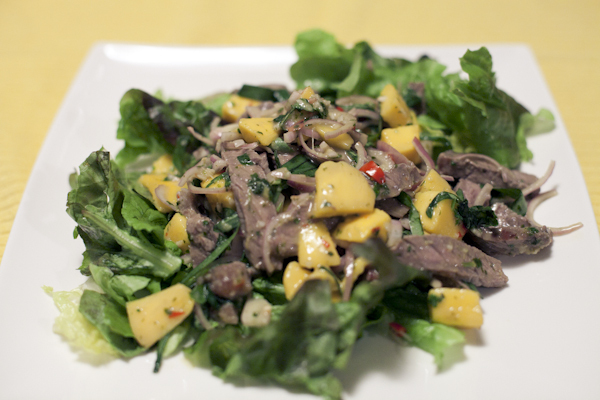 thai beef and mango salad | .liveit.loveit.blogit. 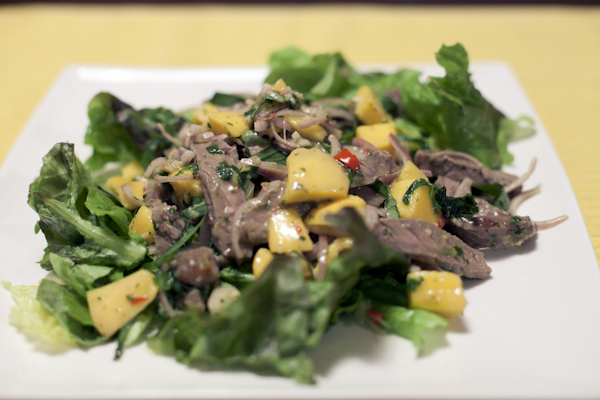 I have to say, I’ve been a bit remiss on posting this amazing recipe for thai beef & mango salad. I found a draft in my drafts folder, from June 1, 2011. You read that right… 2011. So, I’ve been intending on posting about this salad for 383 days. In any event, now is a great time to post about it. Firstly, since it is my brother’s birthday and he is in Thailand (HBD Dano!) and secondly because we enjoyed this salad again last Friday night. It formed part of a thai-stravaganza, featuring: summer rolls, this salad, red curry, and a tapioca coconut cream desert. The recipe for this salad comes from the William Sonoma Asian cookbook, which I picked up for about $15 at Safeway in my first year of law school. I selected it because I liked the pictures. That’s how I rolled back then. Ok. still. It’s super tasty, pretty easy (especially if you prepare the marinade and the dressing the night before), and fun. Who doesn’t love a salad with green, red, and yellow? You could probably make a pretty delicious version of this by marinating and grilling extra firm or pressed tofu as well. Serves: 6 as part of a larger meal, 3-4 as a complete meal. Marinade: Mix together coconut milk, fish sauce, garlic, sugar and cilantro in a large ziplock bag. Add flank steak or tofu, coat well, and marinade in fridge for up to 24 hours. Bring to room temperature before cooking. Dressing: Seed and chop the chile, and combine in a mortar with the garlic, cilantro stems, mint and pepper and grind together with a pestle until a paste forms (if you don’t have a mortar and pestle, you can just smoosh them together with something heavy until you release all the juices). Transfer the paste to a bowl and whisk in fish sauce, lime juice, and sugar. Drizzle in the oil while whisking. Cover and refrigerate until serving. Peel the mangoes and cut flesh into thin slices. Using only the bulb of the lemongrass, peel away the tough outer layer, smash the stalk with the side of a chef’s knife, and cut on the diagonal into 1/8 inch slides. Seed and julienne the chile. Set aside. Heat up your bbq (you can also bake protien in the oven or cook it on the stovetop, but bbq is my preferred method). Remove protein from marinade, pat dry, and bbq/cook to your liking. Meanwhile, line a serving platter with lettuce leaves. If serving flank steak, slice across the grain into thin strips. Pour juices into dressing and stir well. If using tofu, slice into thin strips. Add protein, mangoes, lemongrass, chile, shallots, and julienned herbs to the dressing and toss to coat. Spoon mixture on top of lettuce and serve.